As well as his speed which made him a constant threat on the midfield, his impressive stickhandling ability was described by his Toronto Tecumseh opponents during the New Westminster Provincial Exhibition Tournament of 1907 as “the greatest they had ever seen”, along with that of his Salmonbellies team-mate Len Turnbull. Both New Westminster boys had attracted the attention of the Tecumseh management so much so that in October 1907 there were attempts to lure ‘Pat’ and Len eastwards to suit up for the Tecumsehs for the 1908 season. Instead, both remained in their home town – and when they did go east that year, it was to help the New Westminster Salmonbellies win the first of their many Minto Cup championships. Oddly enough, when Toronto Tecumsehs returned to British Columbia for their 1909 Minto Cup challenge against New Westminster, Feeney was forced to sit out the series when he came down with a case of rheumatism which sidelined him for half the season. He stepped into the shoes of the legendary Alex ‘Dad’ Turnbull as the Salmonbellies’ pivot player in the midfield when age caught up to ‘Dad’ and he was forced to retire due to injuries. ‘Pat’ Feeney learnt his trade as a student of the veteran Turnbull and his playing style mirrored that of ‘Dad’. In 1908, he was chosen for the Canadian Olympic lacrosse team but never ended up making the trip to London. Amongst the professionals on the Pacific Coast, Feeney is tied with teammates Cliff ‘Doughy’ Spring and Dave ‘Buck’ Marshall for the most seasons played – with 13 pro campaigns under his belt between 1909 and 1923. Only Spring played in more games than ‘Pat’ Feeney’s 141 appearances for New Westminster. ‘Pat’ ranks in at sixth place in the Coast pro game both for career points (100) as well as goals scored (95). He was sent off for 34 penalties and accumulated 203 minutes, making him the 13th most penalised player on the Coast during the pro era – although his penalty totals were buttressed by 8 or 9 games where fisticuffs or ‘unsporting’ play were a likely cause. Otherwise, by and large, he was a relatively clean player for the era, when he wanted to be. He played four seasons without a single penalty and two more seasons with just one lone infraction in the campaign assessed to his name. But when the situation required it, the Irish veteran could be devilishly crafty and even annoying at times – and proud of it. In one August 1923 game, in the final months of his career and knowing his playing days were numbered, the wily ‘Pat’ trotted on as a substitute in the second quarter and proceeded to goad his opponents into fighting as a means to draw them off to the sidelines to serve penalties. Knowing full well he was up against a soft referee in the guise of ‘Grumpy’ Spring, Feeney took advantage of the situation and exploited it to the fullest – his logic being that having the Vancouver Terminals down by a better player in exchange for the old vet was a better advantage for his New Westminster team-mates. Whether it was deemed ‘sporting’ or not is another matter. A bitter Vancouver Daily Province would bemoan the following Monday morning about how Feeney was done as a player and had spent the entire game laughing about his antics from the sin bin and getting away with them. 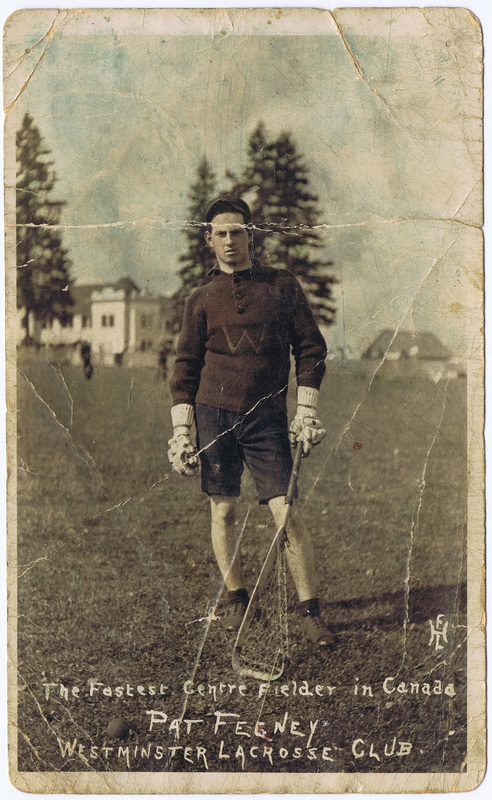 ‘Pat’ Feeney would manage the New Westminster Salmonbellies for one season, in 1922, relegating himself into a substitute role in which he remained until he retired from active play at the end of the following season. His parents moved to New Westminster in 1881, five years prior to his birth. 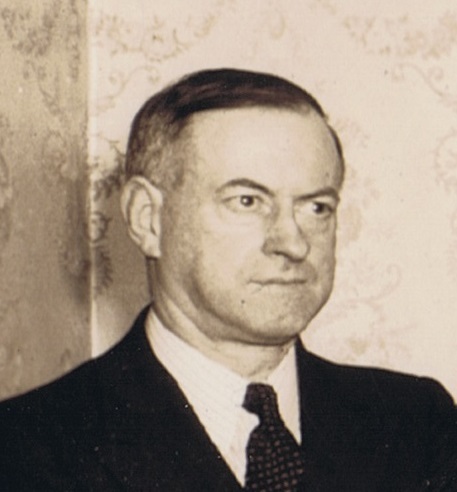 For his employment Feeney first worked in the cigar manufacturing trade before his appointment to the staff of the liquor store in New Westminster in 1921. He retired from there around three years prior to his death. James ‘Pat’ Feeney passed away at the age of 62 in 1948 – survived by a son and a step-daughter who both were living on Vancouver Island at the time of his passing. He was posthumously inducted to the Canadian Lacrosse Hall of Fame in 1966. Vancouver Province cartoon of lacrosse players and referee ‘Grumpy’ trotting behind; ’Pat’ refers to ‘Pat’ Feeney, respected as one of the fastest players in the game – even at age 37 when this was drawn.